The D-Day landings in June 1944 were the single largest seaborne assault ever undertaken, involving 156,000 Allied soldiers being put ashore with countless sailors and airmen at sea and in the air. The men and women of the Normandy campaign of June to August 1944 hold a special place in the nation’s heart. With your help they will be honoured and treasured forever at The D-Day Story. 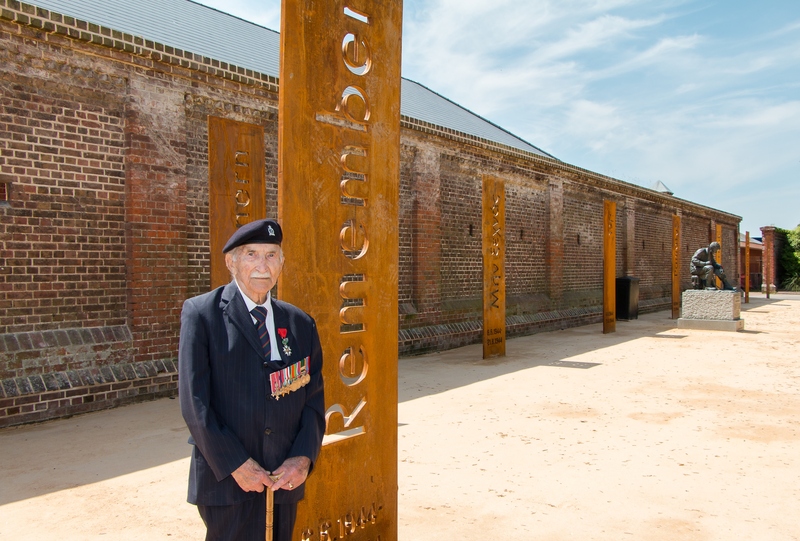 To help raise funds for an ongoing education programme and in conjunction with the re-opening of The D-Day Story, Portsmouth, a memorial wall has been created on which the names of those who took part, regardless of nationality and arm of service, can be recorded. Families and friends of those who took part in the campaign are invited to commission the engraving and installation of a brick bearing the name and unit of the person they wish to honour and remember. In addition, the participation and sacrifice of military units can be recorded by having their crest or badge installed on a larger plaque. Minimum donations of £100 (for individual names) or £500 (for unit badge plaques) are requested to cover the cost of engraving, installation and maintenance. Larger donations will enable us to further support the work of The D-Day Story. All contributions are much appreciated. Applications, together with your donation, may be made by downloading and printing a copy of the form, and sending it to the Portsmouth D-Day Museum Trust as described below. On receipt, arrangements will be made for an engraved brick slip (for individual names) / plaque (for unit badges) to be engraved and you will be notified once it has been installed. In person at The D-Day Story. Please complete this form and hand it to staff at The D-Day Story during normal opening hours. You can donate by credit card, cash or cheque (cheque payable to ‘Portsmouth D-Day Museum Trust’). By email. Download the form as a Word Document here and, once completed, email it to mvs@portsmouthcc.gov.uk. By post. Please make your cheque payable to ‘Portsmouth D-Day Museum Trust’ and send to: Portsmouth D-Day Museum Trust, c/o Portsmouth Museum, Museum Road, Portsmouth PO1 2LJ. Please write the veteran’s name on the back of the cheque for reference and enclose a completed form. By bank transfer to Portsmouth D-Day Museum Trust (sort code 56-00-64, account no. 41322487). Please give the veteran’s name as the payment reference. Please also complete the form and send it to us. Donate online here. In the message section on the second page, please write “Memorial Wall” and the name of the person to be commemorated. Please also complete this form and send it to us. Whose names are eligible to go on the wall? The memorial wall is intended for the names of anyone who took part in the Normandy campaign, regardless of nationality and arm of service. What format should be used for the person’s name? Due to space limitations and for consistency we can only include the person’s first name(s) and surname, up to 16 characters in total including spaces. If you feel you need more characters, please contact us in advance of your donation to clarify this. Ranks or post-nominal letters such as medals will not be included. What does the “killed in action” question mean? A mark on the brick will indicate those individuals who were killed in action or who died of wounds sustained during the fighting from D-Day onwards. If you want to check the unit that an individual was serving with in Normandy, see the Family History section of our website. How quickly will the brick or plaque be in place? New bricks and plaques will be installed at regular intervals once they have been engraved. You will be notified once yours has been installed. We reserve the right to refuse donations if the proposed details may offend.